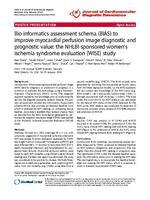 POSTERPRESENTATION OpenAccessBio-informaticsassessmentschema(BIAS)to improvemyocardialperfusionimagediagnosticand prognosticvalue:theNHLBI-sponsoredwomen s ischemiasyndromeevaluation(WISE)studyMarkDoyle1*,GeraldPohost7,LesleeJShaw8,DianeVThompson1,SherylFKelsey2,BDeliaJohnson2, WilliamJRogers4,GeethaRayarao1,BarryLSharaf5,CarlJPepine6,CNoelBaireyMerz3,RobertWBiederman1From 17thAnnualSCMRScientificSessions NewOrleans,LA,USA.16-19January2014BackgroundIntroduction:Whenassessingmyocardialperfusionimage (MPI)datafordiagnosisorpredictionofprognosisitis commontoevaluatethetechnologyusingaReceiverOperatorCharacteristic (ROC)curve.Thediagonal responserepresentstheknowledgepriortoconductingthe test(i.e.thediagonalrepresentsrandomchance).WepresentanapproachtermedBio-InformaticsAssessment Schema(BIAS)thatprovidesanelevatedbaselinefrom whichtoevaluatetheMPIreading,i.e.indicatingthatat baseline,moredataisavailablethanrandomchance.Here wedescribehowtheBIASformulaearegeneratedforcardiovascularmagneticresonanceimage(CMRI)dataapplied totheWomen sIschemiaSyndromeEvaluation(WISE) Study.MethodsMethods:Women(n=182),meanage5911yrs,with symptomssuggestiveofmyocar dialischemiaunderwent MPIandcardiacfunctionevaluationseparatelybyCMRI andSinglePositronComputedTomography(SPECT)and werefollowed(4017months)todocumentMACE(CV death,myocardialinfarction,andhospitalizationforcongestiveheartfailure).Abnormalperfusiondefectswere notedforeachMPImodalityusingclinicalcriteria(clinical reading)andifatleastoneregionwasabnormal,thestudy wasconsideredtobepositivefordisease.Multiplelinear regressionmodelsweregene rated,eachpredictingMPI statusfromonemodality(e.g.CMRI)usingdatafroma secondmodality(e.g.SPECT).TheBIASmodelswere generatedbyremovingthemy ocardialperfusionstatus fromthelinearregressionmodels,i.e.theBIASequations didnotcontainanyknowledgeoftheMPIstatus(e.g. BIASmodel=-.43+endsystolicvolumeindex0.011+ averagemyocardialwallthickness0.037).Thearea underthecurve(AUC)forROCanalysiswascalculated forthenaturalMPIstatusoftheCMRIdataandforthe BIAScurve.ROCanalysiswasconductedfordetectionof obstructivecoronaryarterydisease(CAD 50%stenosis) andpredictionofMACE.ResultsResults:CADwaspresentin57(31%)andMACE occurredin22women(12%).ForpredictionofCAD,the AUCswere:clinicalMPIreading0.68andBIASreading 0.67(Figure1).ForpredictionofMACE,theAUCswere: clinicalMPIreading0.54andBIASreading0.77(Figure2).ConclusionsConclusions:BIASmodeling,incorporatingcardiacvariablesmeasuredbyCMRI,producedanelevatedbaseline onROCanalysis(diagnosticandprognostic)thatwas higherthantheclinicalMPIreadinginprognosticcase. ThesignificanceofthisisthatthiselevatedbaselinerepresentstheinformationstatuspriortoreadingtheMPIdata. ThenextlogicalstepistoincorporatethisbaselineknowledgeintoreadingtheMPIstatus,whichisexpectedto resultindramaticimprovementofMPIdata. 1CardiacMRI,AlleghenyGeneralHospital,Pittsburgh,Pennsylvania,USA FulllistofauthorinformationisavailableattheendofthearticleDoyle etal JournalofCardiovascularMagnetic Resonance 2014, 16 (Suppl1):P201 http://www.jcmr-online.com/content/16/S1/P201 2014Doyleetal. ;licenseeBioMedCentralLtd.ThisisanOpenAccessarticledistributedunderthetermsoftheCreativeCommons AttributionLicense(http://creativecommons.org/licenses/by/2.0),whichpermitsunrestricteduse,distribution,andreproductionin anymedium,providedtheoriginalworkisproperlycited.TheCreativeCommonsPublicDomainDedicationwaiver(http:// creativecommons.org/publicdomain/zero/1.0/)appliestothedatamadeavailableinthisarticle,unlessotherwisestated.